Last night, or should I say this morning, I awoke at 3:30 am. I have no idea why, I’d been soundly asleep, and nothing particular seemed to rouse me. As I lay there for the better part of two hours, trying in vain to fall back asleep, a thought popped into my head. Actually two thoughts. First I started thinking about yesterday’s Coconut Cauliflower Curry. It was very yummy, and if I hadn’t been so tired I’d have been tempted to go have some. Instead I just thought about eating it today, and of course, what else I would eat. CALL ME ONE TRACK. Anyway, I started thinking about what would taste good with the remainder of the curry. We had some leftover rice, but what else? Oooh.. TOFU! Baked tofu! Of course I had to share. 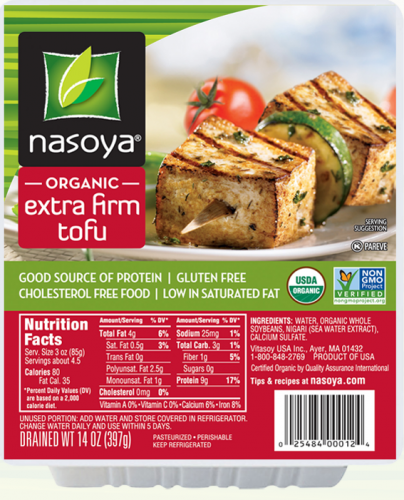 In addition to being organic, GMO-free, gluten-free, cholesterol-free, low in fat, and high in protein, Nasoya tofu is also incredibly low in sodium! WIN! Remove the block of tofu from the package and drain the liquid. Place the block of tofu between several layers of paper or cloth towels and gently press down to remove as much liquid as possible. You can place a plate or something on top of the tofu and let it press for up to an hour. I will be honest, I don’t have the patience for that. So I just press my tofu well by hand (making sure not to squeeze it too tightly and disfigure it). 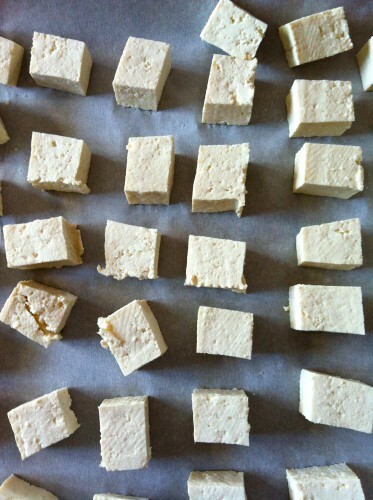 After pressing, I cut the tofu into roughly 1-inch cubes. You could cut it into “cutlet” type pieces, large or small, too. Magically delicious cubes of crispness! The toothsome texture reminds me a lot of cheese, a little tough on the outside, moist and dense inside. And whereas plain tofu is extremely bland, baked tofu offers a more pronounced flavor. I’m not ashamed to say I like eating the little baked cubes straight from the oven. They’re so good! As you can see from the tofu package above, a fourth of the (almost) pound of tofu will set you back just 28 mg of sodium. You could eat the entire block yourself (not that I have.. cough, cough) and it’s still only 112.5 mg total. Pretty freaking amazing. Baked tofu is a perfect addition to soups, salads, stews, sandwiches, chilis, curries, and more, adding not only protein and nutrients, but also an appealing, toothsome bite. Really hope you try it. ENJOY! 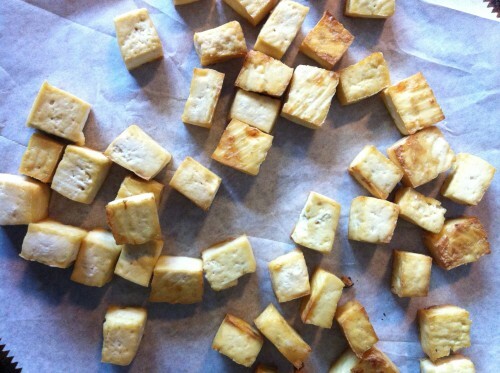 This entry was posted in From the Kitchen and tagged baked tofu, baking tofu, Nasoya, Tofu. Bookmark the permalink. What a great idea I hope I like the cubes right out of the oven I’m always looking for more protein. Thank you! Also, how great that you built on the leftovers. I was just thinking that I wouldn’t have the energy to do another whole meal tomorrow. I will definitely try this most easy recipe! Thanks to you and others I have been living a vegetarian and low sodium lifestyle for the better part of a year now. I feel better today than I have in years. However, no amount of “soy trickery” can replicate the flavor and texture of a fine artisan cheese produced from the milk of healthy pampered cows. I’m sorry, but I just can’t see myself as a sickly, pasty-faced vegan. Randall, that is wonderful! Cannot tell you how happy I am to hear you’re having such success on a low-sodium/vegetarian diet, and that I’ve helped! Terrific! This post was not written to suggest that baked tofu = cheese. It was simply intended to highlight another wonderful source of protein that’s incredibly low in sodium.